Yea, she was right. Climbing a mountain is one thing. 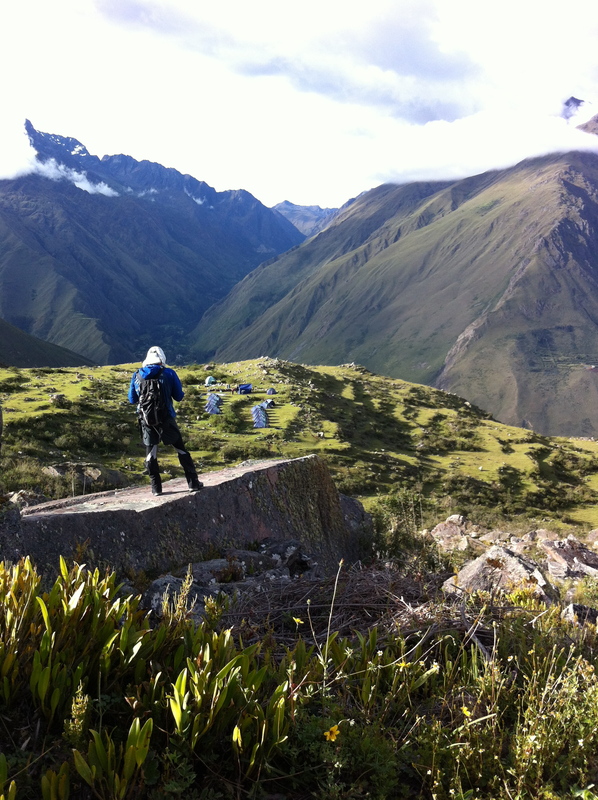 Climbing one in the Andes when you begin at 10,000 feet is quite another. I am not a mountaineer, nor even a regular climber, but I had been “training” for several weeks for this trek. By training I mean walking on the treadmill at a #5 incline. When we arrived to Ollantaytambo and one of our guides pointed high in the sky and said, “that’s where we’ll camp in a few days,” I had to laugh. Out of fear, I mean. The treadmill training suddenly seemed so insignificant, and all those steps in preparation so lame in comparison to the imposing monstrous peak before us. We set off on a sunny Saturday morning. We walked out of the village, packs on our backs, faces smeared with sunscreen (which is, unfortunately, nearly ineffective so close to the blazing sun) and waters bottles full. The porters and the 14 beasts of burden carrying sleeping bags, tents, food, water, fixings for snacks and meals and sundry items had left before us so they could ready the campsite. 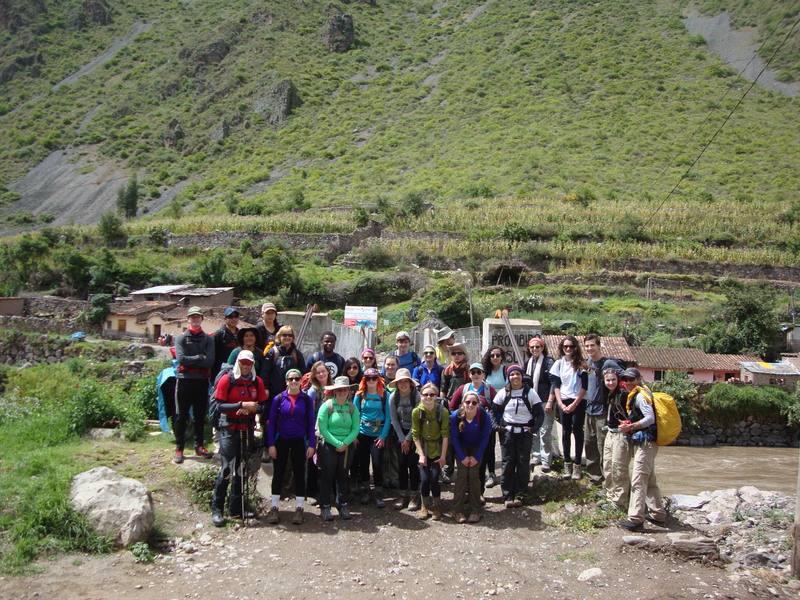 Spirits were high and the students seemed undaunted by trail before us. The trail rose slowly at first and the hills filled with the sounds of laughter and chatter. Then the trail steepened sharply. The group began to spread out; eager hikers in the front, the lung- and leg-challenged in the back. Perhaps you can guess where Maria and I found ourselves – but I will say that it wasn’t really the strain on our limbs that slowed us, it was the altitude. As the air thinned, the sounds of panting replaced the chatter. And rightly so. Still, the mood never dipped. We all felt grateful to be surrounded by such beauty, such history. The mountains, though terrifying in some ways, also impart a feeling of joy. 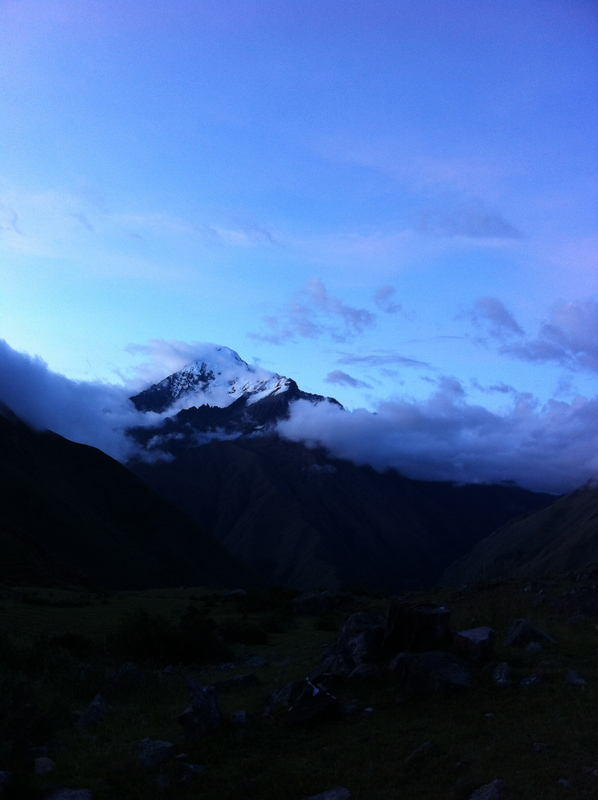 They are home to the Andean people and this feeling of ‘home’ is somehow inexplicably palpable. We all stopped several times along the trail to survey the amazing mountain scape, to see how tiny the rooftops of the village had become. Well, we stopped to catch our breath and THEN appreciate the beauty around us. A few hours into the hike we stopped for lunch. And not just any lunch: a hearty meal of freshly made quinoa soup, a salad of cucumbers and tomatoes, chicken, rice, vegetables, and bread. The porters had set a table for 28. They chopped vegetables on cutting boards on their laps. They’d hauled up a propane tank and a two-burner camp stove on which they sautéed the chicken, boiled the soup and rice. I repeat, FOR 28 PEOPLE! It was a remarkable scene with about 5 men and two boys busying themselves with food preparation as the horses and donkeys munched on grass. Nearby, the ruins of the first church near Ollantaytambo, a now-roofless adobe structure. Jagged peaks as far as the eye could see. And all of us enjoying the respite from the hike, the delicious food and fellowship. After a decent rest, we resumed our trek. The last two hours of the hike were the most strenuous. The trail was narrow and steep. We marched single file, step-by-step upward. My fear of heights has never been tested so vigorously. On one side was rock, on the other a cliff. I will admit to moments of being unsure whether I could go on. (I can say this now that we’re all back safely.) But I focused my eyes on my feet, not on the valley waaaay far below and trudged ahead. I also focused on the students: responsibility is a great motivator! A group of us happily made up the rear squad, stopping every 10 -15 steps or so to breathe and simply to marvel. It must be noted here how well our students took care of one another. Lindy had fallen ill the night before, but was determined to make the trek, a testament to her fortitude. Nic, one of the student leaders of the day, kept an eye on her, hanging back for periods to walk with her. Alo carried her pack. All the students frequently checked in with one another, making sure we all were doing well and feeling OK. They shared water and snacks. The care and concern they showed for one another was a remarkable thing to see unfold. We had become a solid team. We knew we were nearing our campsite when the plateau, the altiplano, became visible. Evidence of the canteras (quarries) was all around. 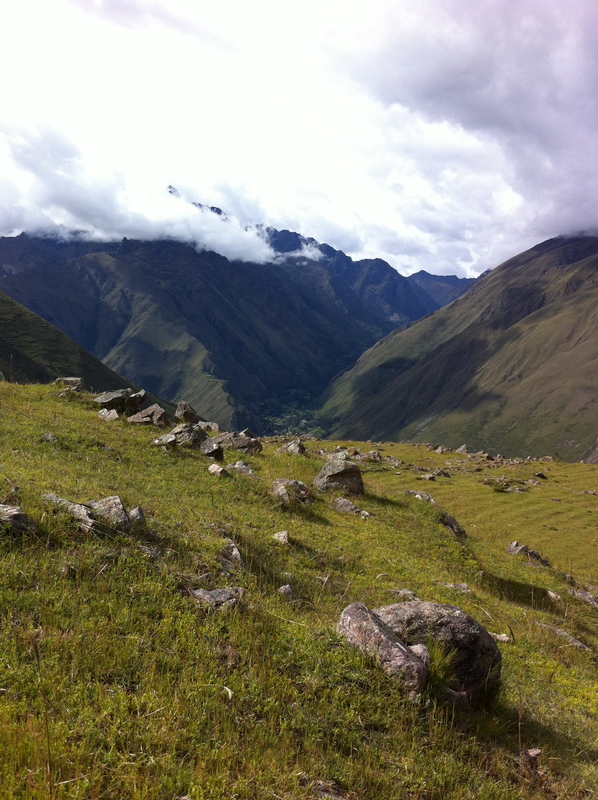 Stones of all sizes were embedded in the mountainside, as were stone paths, laid by the Inca. 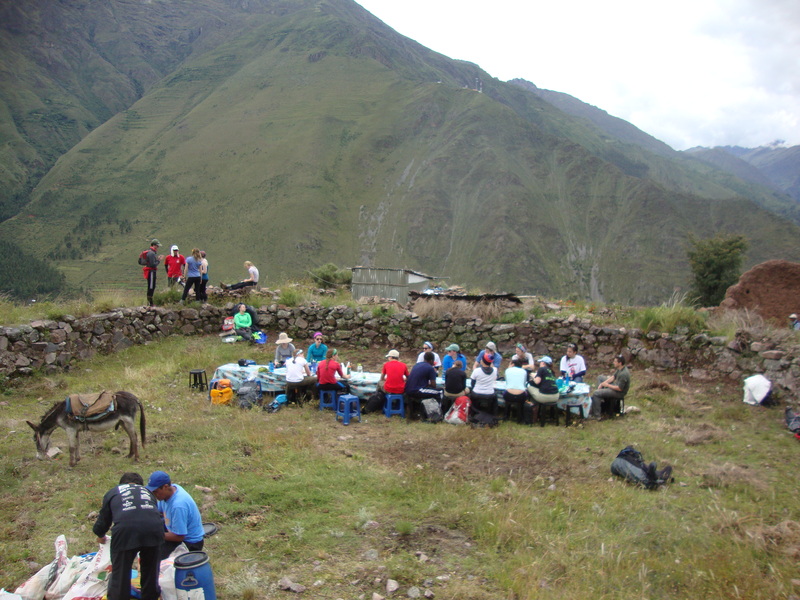 At last, we stepped up onto the plateau to find tents pitched and our troupe of porters already preparing sustenance. At 12,000 feet. Our campsite. The blue dots are our tents. The scene I witnessed next will remain in my heart forever. The students naturally spread out over an area of about 200 yards. They had taken up spots on rocks, mostly individually, to reflect, write, draw and soak up the most glorious vistas our eyes had ever witnessed. Snow-capped peaks surrounded us. The village we had left that morning was now just a collection of miniscule specks of orange in the valley below. The sun was beginning to dip behind Veronica, our neighboring Ande, and the sliver of white moon was ascending over us. The wind whipped our hair. Two of our boys ran laughing across the flat plain, their voices rising over the wind. The peaceful, contented faces of our students filled me with joy and – there is no other word – love. 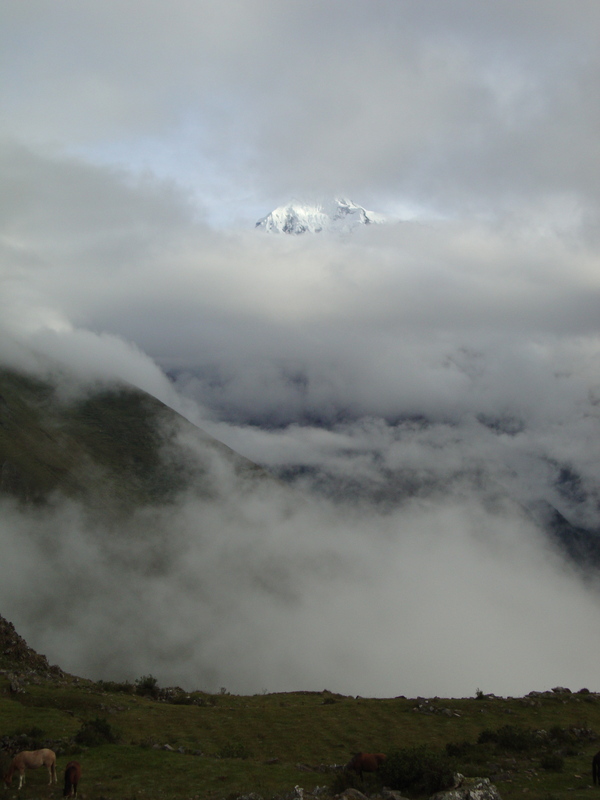 We had arrived together to a place of importance for the Earth, for the Inca before us, for the Andeans now, and for us – and we felt it deeply. As if unfazed by hiking four miles of trails to get there, we eagerly took Randall and Javier up on the offer to hike up some rocks near the campsite to visit mummies and meditate. 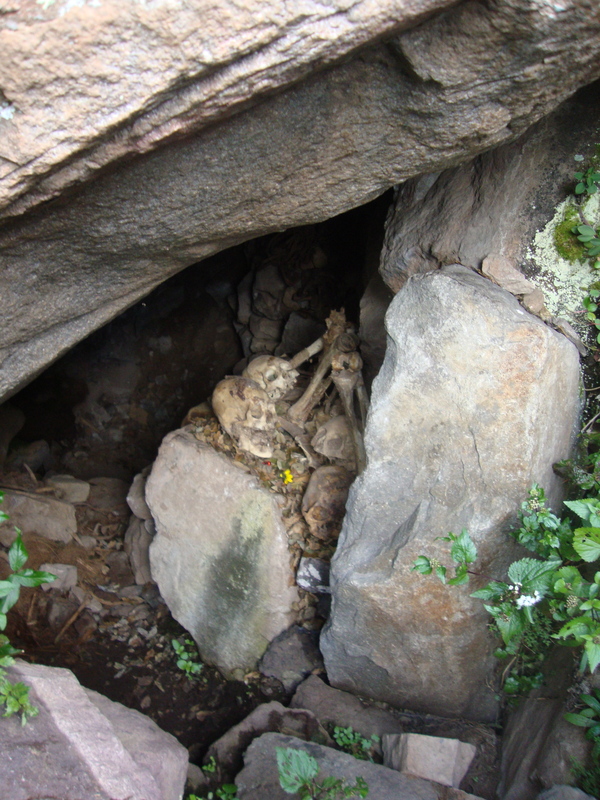 We scrabbled over fallen, loose rocks to a cave that was a burial site for the Inca. A peek inside revealed several skeletons, many still positioned in burial poses. For most of us, it was the first time we’d seen human remains, certainly in this way. It was at once creepy, powerful, spiritual and COOL. I don’t mean to diminish a burial site by calling it ‘cool’, but it was. From there we hiked up further still to find rocks on which to meditate. Silence fell as we considered where we were, how we got there, how we felt. Many times I was reminded of centering down in Meeting for Worship. We centered. We reflected, prayed, considered, and let the world fall away. I felt the strain of the hike wash away and my lungs fill with the oxygen I’d lacked for so many hours. I’m sure it was an illusion – there was no more oxygen. There was just more. Our kindly porters made us popcorn and hot chocolate to share as the sun retreated. We crammed ourselves into the ‘mess hall’ – a series of three tents with long banquet tables – to gobble, sip, tell stories and, mostly, laugh. But the porters weren’t finished. Then came an amazing two-course dinner, followed by coca de mate – tea of coca leaves – to quell the effects of the altitude. Bedtime wasn’t far behind. We were exhausted from our physical and emotional journey. I fell into blissful sleep amid the sounds of giggles in nearby tents. I have never been more tired, nor more happy. 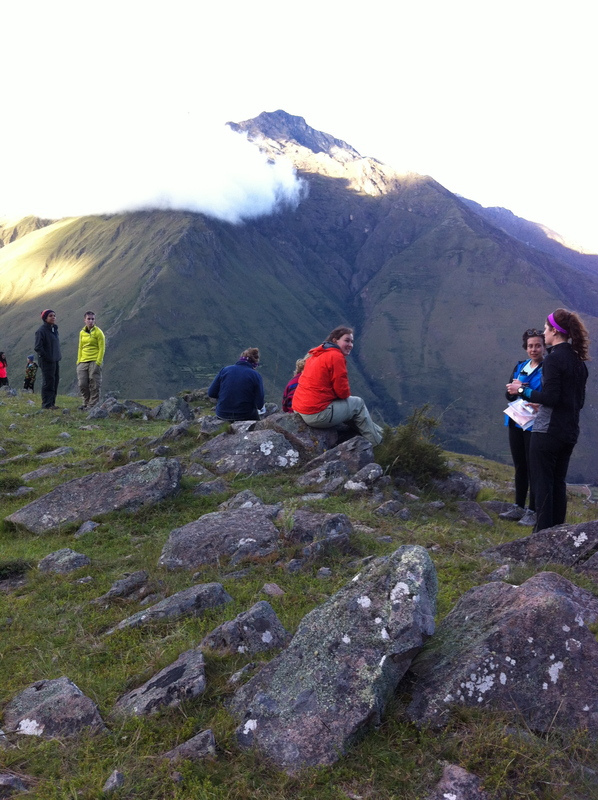 Morning comes early in the Andes and by about 5:30 or 6:00 a.m. most of us were up. Vanity had long since taken a hike and while hair brushes were forsaken, tooth brushes were not. There are just some things you can’t give up, even in the mountains. After breakfast, Randall, one of our guides, asked us each to find a rock that spoke to us, and there we began our vision quest. He asked us to be silent and let the mountains bring us a question, a question that we would later seek to answer at Machu Picchu. These moments of communing with the mountains were profound. The silence was profound and personal. I have to leave it at that. After our time of reflection, about half the group climbed remaining way up to the summit to meet the Inti Punku – Quechua for ‘the door of the sun.’ I stayed behind with the rest of group. Each of the remaining students, Maria and I hiked to a rock and spent hours meditating. I was amazed by how natural and easy this meditation was for all. It was as if we were called to do so by some force outside ourselves. No one resisted the call of introspection. There were no skeptics. All arms were open to the experience. When the rest of the group returned from the summit, we hoisted our packs on our backs once again and descended the mountain, this time by another trail. Is it crazy to say that going down was harder than going up? Maybe. But it was! The force exacted on knees, feet and hips to steady us on our descent was incredible. It’s silly, but I had a moment when our group reminded me of the scene in “The Sound of Music” when the von Trapp family is walking through Alps, single file to freedom. There we were marching down through tall grasses and lovely flowers, over a stream, past barking dogs, and finally along the road back to our village where we would sleep and dream of the day gone by. 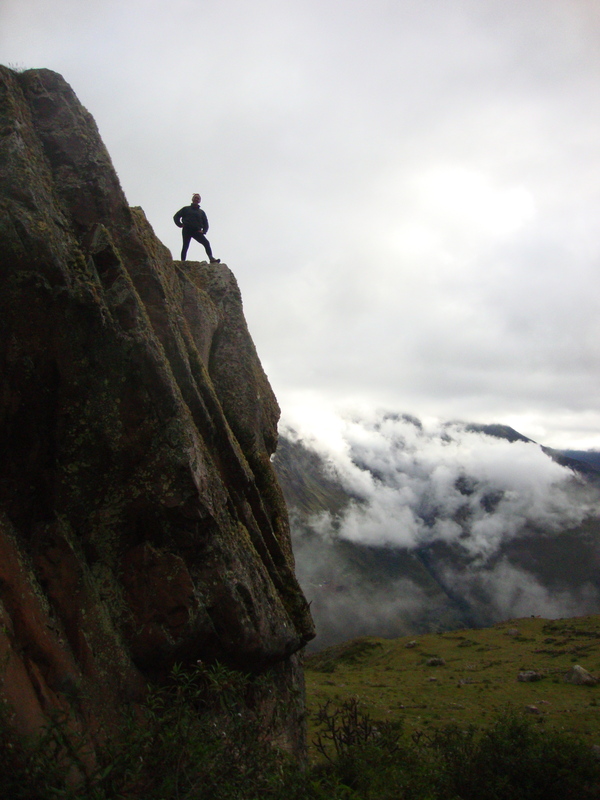 Each of us would consider this climb the highlight of our journey. Although I’ve just employed a ridiculous amount of words, I still feel that I’ve not accurately described what we saw and felt up there on top of the world. Are there new words I could invent? No, even they would be an ineffective substitute for the reality. Even my photographs leave something missing, just out of sight. And perhaps that’s exactly how it should be. Perhaps the experience is ours alone, vanishing into thin air when we try to capture it. Thank you very much for the sharing!